I am a Quaternary Scientist and specialist in geochronology. 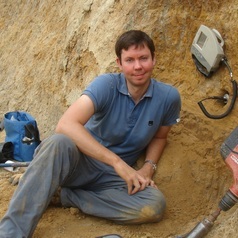 My research focuses on reconstructing archaeological, palaeoecological and palaeoenvironmental histories using luminescence dating techniques, with a particular emphasis on single-grain OSL dating applications and advancements. I obtained a DPhil in Geography at the University of Oxford in 2006 and have held research positions at the University of Wollongong, Australia, and the National Research Centre for Human Evolution (CENIEH), Spain. During my career I have been awarded two Australian Research Council (ARC) Fellowships, and was formerly the director of the National Luminescence Dating Facility in Burgos, Spain. I have also worked extensively at archaeological and palaeontological sites across Europe, North America, North Africa, Australia and Russia.